This could either be an animation or short film. The imagery of someone walking upsidedown against the night sky is what stuck in my mind. 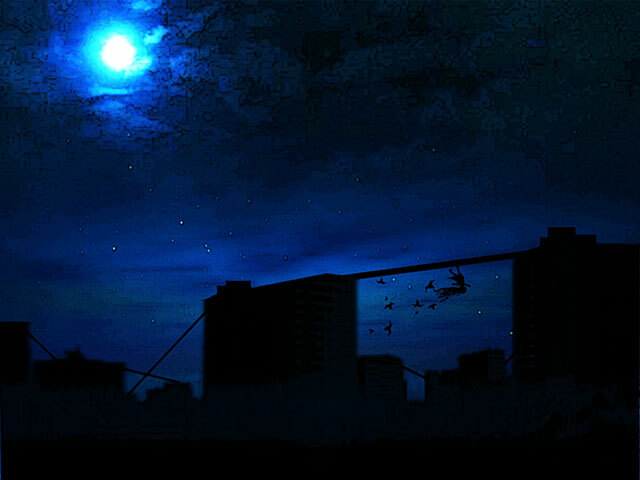 Scene starts panning down from a cloudy, moonlit night sky to a girl standing on the edge of a highrise rooftop with her arms out. It looks like she is about to fall, but as she goes over the edge, the camera rotates to instead show her walking down the side of the building, apparently sleepwalking. There is a wistful element as her hair is constantly flowing and her arms are out to balance. The elements seem to whirl around her as she walks, as if animated by what she is dreaming. The iconic scene is of her walking upsidedown on the bottom of a plank between two highrises against the backdrop of the moon and night sky in the background. Eventually people in the windows start to notice her and poke their heads out, making a lot of chatter. Some start to laugh and point fingers. This builds up enough to wake her, still upsidedown. She is amused at first by being upsidedown but soon notices the laughter and jeering at her, which erases the wonder from her face. She starts to get nervous and taken aback. Gravity seems to be gradually coming back to her, as her hair slowly stops flowing and begins to hang. The wind and other elements from her dreams also start to fade away. She tries to back away, only to stumble and then fall into the darkness below. - the sky above is well lit, a deep vivid blue, but the actual world below is pitch black. - the main character is walking along rooftops, and everyone else looking out their windows is below her in our perspective but above from hers (because she is upsidedown).